Get Cosy, Creative and Crafting With These Handmade Christmas Gift Ideas! As the nights draw in and the temperature dips, pre-Christmas evenings make the perfect time to keep cosy and get crafting. Not only can you make beautiful creations for yourself, why not turn your talents to making some stunning handmade Christmas gifts for your nearest and dearest. Here’s five of our favourite money-saving and creative gift ideas that are easy and fun to do. No room for a table football set in your house? No problem! 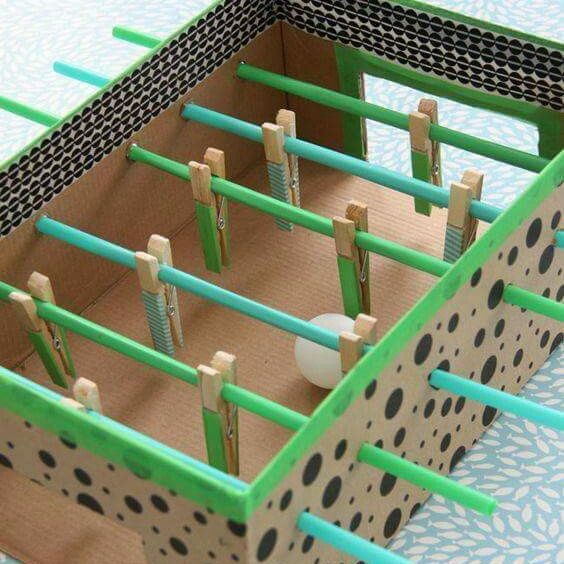 This handmade table football will comfortably sit on a tabletop, making it great for smaller spaces. Children (particularly those who are football mad) will love decorating and playing with this, so make it together for a great way to spend a cold Winter’s evening! Using just an old box or shoebox and some cheap materials that you might even have around the house, this is truly creative crafting. It’s really simple to make too. First of all, decorate the box however you like, and paint the pegs different colours to represent two different teams. Use a craft knife to cut out two goals. Hold the skewers against the top of the box, and mark where the hole needs to go before punching holes in each side for the skewers. Put the players (the pegs!) in position – you may want to glue them on for extra stability. On the end of each skewer, you may also want to put a wad of bluetac or a cork to make it easier to hold. This money saving treat is great fun to make, and to play with. Whether you’re making it as a handmade gift or to bring a lively addition to the Christmas lunch table it’s sure to be a hit! This is a great idea, and is so easy that it will appeal to all ages. Not only that, but these make a truly personalised handmade Christmas present, and it’s cheap too! Simply buy plain mugs and some Sharpie pens, and decorate them with your personalised designs and messages. Bake the mugs in an oven for 30 mins at 170 degrees C and then leave to cool before hand washing and using. These are perfect personalised Christmas presents that anyone can make, so get crafting today! As the nights draw in, it’s nice to make your home extra cosy by putting on candles, and these lovely candle holders add a personal touch, making a great handmade Christmas gift idea. Not only that – they’re really cheap and easy to make too! 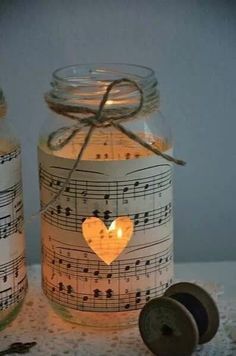 Simply cut out a shape from some newsprint or music paper and cover a glass jar with it, as in the images. 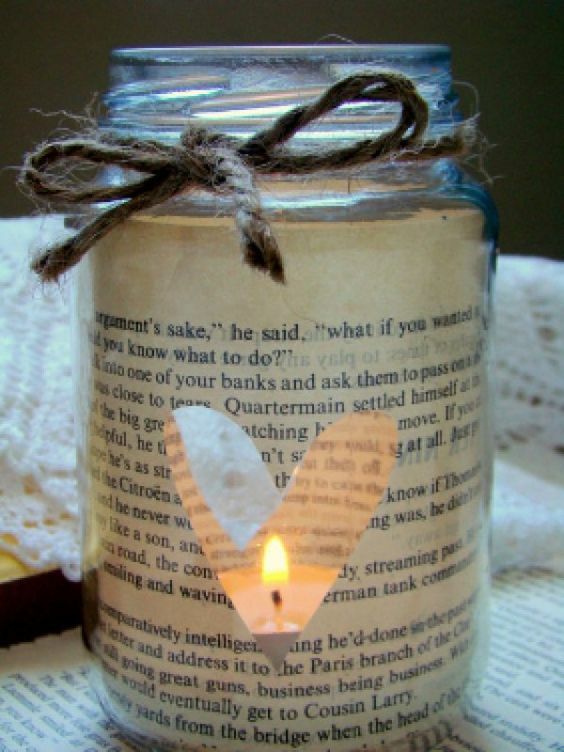 Add a tealight and some rustic string and, hey presto, you’ve created a beautiful, bespoke candle holder! Personalised badges make a perfect handmade Christmas gift – ideal as stocking fillers! As well as that, badge making is great fun, and is a lovely way to spend some time indoors whilst it’s freezing cold outside! Both children and adults alike will love creating their own badges, which are really easy to make using a handheld badge making machine. With just a badge maker and component set, you’re able to design your artwork and press it onto badges, keyrings, mirrors, fridge magnets and medals. It couldn’t be simpler! These superb stocking fillers are truly unique, and with the designs limited only by your imagination they’re a great way to exercise some creativity too! Slightly older children (and adults) might like to make one of these stunning cards for a loved one at Christmas. They’re a bit more challenging to make, but the results are amazing, and the effort that goes into these really shows in the finished product! This blog has a great and in-depth tutorial on how to make 3D cards – once you get the hang of it it’s relatively simple, and the surprise on the recipient’s face when they open it is certainly worth the effort! These are just a few of our favourite craft ideas for the Christmas period – we’d love to hear if you have any more. What are your favourite crafts to make on a cold winter’s evening?